In 2014, smartphone giant Samsung has released Samsung Galaxy S5, Samsung Galaxy Alpha, Samsung Galaxy Note 4 and Galaxy Note Edge. Additionally, Apple announced new iPhone models (iPhone 6 and iPhone 6 Plus) to the public. So many good choices are exposed to people. However, people may feel difficult choosing the right cell phone. Thus, this article will focus on Samsung Galaxy Alpha vs Samsung Galaxy S5 comparison. How to Rip DVDs to Samsung Galaxy S5 or Alpha? WinX DVD Ripper Platinum - Fast rip videos from the purchased or rented DVDs to Samsung Galaxy S5/Alpha, iPhone 6 (Plus), Sony Xperia Z3, etc. with high image quality. Play DVD movies anytime and anywhere! What makes Samsung Galaxy Alpha special is the high-quality metal frame. This is Samsung's first attempt at designing a phone with metal frame. Admittedly, the design makes Galaxy Alpha look elegant and luxurious. But can it stand against the Samsung flagship Samsung Galaxy S5? Let's set about comparing Samsung Galaxy Alpha with Galaxy S5 according to their features and specifications. 1. Both of them feature predominantly plastic builds, although Galaxy Alpha is designed with an elegant metal frame. 2. Both have a wide range of colors, including black, white, gold, silver and blue. 3. Fingerprint sensors are built in both Alpha and S5. 4. Heart rate sensor tech is applied in both Galaxy Alpha and Galaxy S5. 5. Both Alpha and S5 come with 2 GB RAM. 6. Ultra Power Saving Mode is available in both Galaxy Alpha and Galaxy S5 to improve battery life. Samsung Galaxy Alpha and Galaxy S5 share a bit of common ground. Nevertheless, there are many differences between them. Samsung Galaxy Alpha vs Galaxy S5: What are the differences? To make clear comparison between Samsung Galaxy Alpha and Samsung Galaxy S5, we'd like to show you the differences in a table. video 2160p@30fps, 1080p@60fps, 720p@120fps 2160p@30fps, 1080p@60fps, 720p@120fps, HDR, dual-video rec. 1. Samsung Galaxy Alpha is cheaper than Galaxy S5. 2. Galaxy Alpha is smaller, thinner and lighter. 3. Samsung Galaxy S5 features larger screen size and sharper display. 4. Galaxy S5 offers a better camera. 5. When it comes to storage space, Galaxy S5 is a bit more popular than Alpha. It offers 16GB and 32GB internal storage. Moreover, it supports for a microSD card to expand storage. 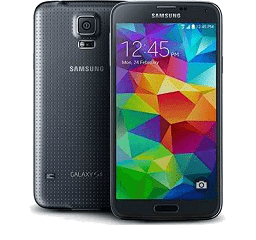 According to the features and specs comparison between Samsung Galaxy Alpha and Galaxy S5, Samsung Galaxy S5 is a notch above Galaxy Alpha. Despite that, Samsung Galaxy Alpha is definitely a nice smartphone. Actually, it will come down to personal choice which is chosen by most. But to be sure, both Samsung Galaxy Alpha and Samsung Galaxy S5 are ideal gadgets to play movies or video clips. No matter which is your choice after reading Samsung Galaxy Alpha vs Galaxy S5, it is helpful to learn how to rip DVD movies to Samsung smartphones. Keep reading to see how to rip classic DVD movies or the latest DVDs, such as Transformers 4: Age of Extinction, Edge of Tomorrow, to Samsung Galaxy S5/Alpha. Thus, you can play DVD movies on the Samsung ph ones on the move. When it comes to DVD ripper for Samsung smartphones, WinX DVD Ripper Platinum is worthy of recommendation. Built in preset Samsung mobiles profiles, this DVD ripper enables users to rip DVD to Samsung Galaxy S5 or Galaxy Alpha supported file formats directly. Furthermore, it is able to access all DVD encryption technologies, such as DVD CSS, region code, Disney DRM copy protection. Thus, all DVDs including the hot movies like Transformers 4: Age of Extinction DVD can be ripped to Samsung Galaxy S5, Galaxy Note 4, Note Edge and other Samsung devices. After downloading and installation, you can process DVD ripping in four simple steps. Step 1. Launch the DVD ripper and load DVD information by clicking "DVD Disc", "ISO Image" or "Folder". Step 2. Specify your target output profile. Step 3. Click "Browse" to choose destination folder. Step 4. Hit "RUN" to begin DVD ripping process. WinX DVD Ripper Platinum also supports ripping DVDs to other popular tablets (Kindle Fire, iPad Air 2, iPad mini 3, etc. 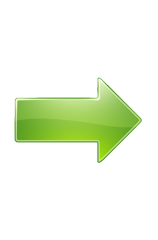 ), mobile phones (HTC One M8, iPhone 6, iPhone 6 Plus, Sony Xperia Z1/Z2/Z3, WP8, etc. ), PC/Mac laptops, smart TV (Apple TV), game consoles (PS3, PS4), etc. However, it is highly suggested to refer to the DVD copyright laws in your country before ripping DVD movies. 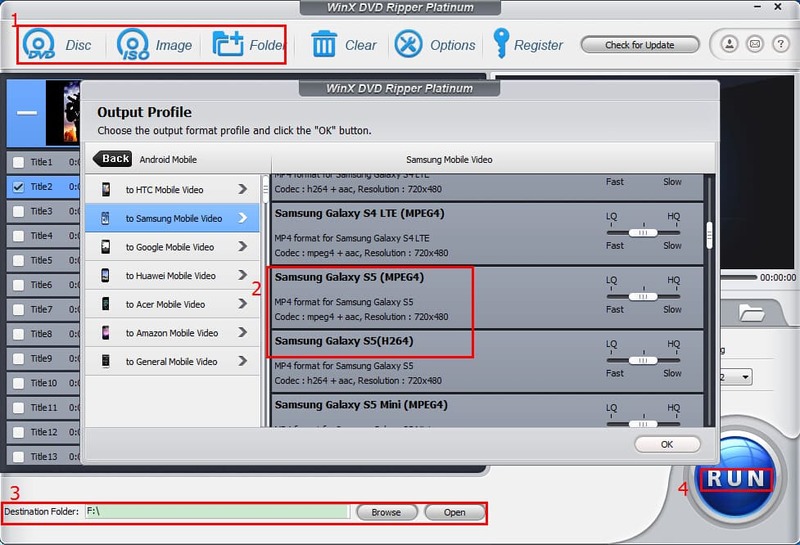 Other Option: If you want to convert HD MKV, M2TS/MTS, MOD or standard AVI, MPEG, WMV, M4V, MOV, RM and VOB videos for your Samsung Galaxy Alpha or Galaxy S5, WinX HD Video Converter Deluxe is your best choice. Even more, it helps download YouTube videos, make ringtones, make slideshow and edit videos for your Samsung Galaxy Alpha or Galaxy S5! Apple iPhone 6 vs HTC One (M8): Which One Is The Better Choice? Apple iPhone vs Samsung Phone: Who Will be the Winner? How to Watch DVD and HD Widescreen Movies on iPhone 6/5S? How to Rip DVD to Sony Xperia Smartphones on PC? How to Rip DVD to Samsung Galaxy Phones/Talets?